Do you want to increase your blog traffic? Chances are, your answer is a big, fat yes! Really, who doesn’t? If only there was a magic formula to increase your blog traffic organically. No money spent, but high quality traffic directly to your blog. If only there was a way to get the highly influential people in your industry to share your blog post with their larger audience. You know they would love your content and your traffic would go soaring. If only they would share your post. Or even better. What if they participated in your post? That would certainly send the traffic soaring. In this post you will learn step-by-step how to create an influencer roundup post, also know as influencer group posts, that will allow you to connect with influential people in your industry, collaborate with them on a blog post and benefit from their larger reach. All of which will increase your blog traffic exponentially and have new readers coming back for more. Before you can even consider who you are going to reach out to, you must first know what topic you are going to reach out to them about. It is very important to have a topic and question ready before you move forward. Even if the question changes some throughout the remaining steps, it will allow you to have a focus and purpose when creating this post. So, how do you decide what your topic should be? The simple answer is: let your customers, or the market as a whole, tell you. Conduct some research to see what topics are popular within your industry and make a list of potential topics. Next, use a tool to identify the search volume and social shares to determine which topics will garner the most attention. Once you narrow down to one topic, create a question that you can ask the influencers. More on that in a little bit. With your question in mind, you now want to identify influencers in your industry. Look for a fit between your audience and their larger audience. You want influence, not just popularity. Popularity: How much you are liked. Popularity is easily manipulated. Influence: The ability to have an affect on the behavior of someone else. Very hard to manipulate. Try setting up an Excel spreadsheet to keep track of the names, emails, contact dates and answers. This will come in handy as you complete the final five steps. Email is the best method to connect with influencers. You can typically find their email on their website (it may be a contact form) or on their LinkedIn profile. These influencers you want to connect with are very busy, so it is crucial that you keep your email short. An intriguing headline also helps to increase the chances of your email being open. We are doing a roundup of social media experts to find out their boldest prediction for 2016 and beyond. As one our favorite marketers, we thought you may want to be involved. We know you are very busy, so a brief response is more than enough. You should wait at least a week or two for responses, as some may not come immediately. Once you are confident that you have received all the responses, you will want to set up your blog post. Be sure to proofread all responses prior to publishing your post. Also, it is important to include the name and job title of each influencer that participated. Including a link to their website is also highly recommended and will help drive traffic back to them. This photo is highly effective because it grabs attention, has recognizable faces and immediately gives credit to the people that participated. If you are not great at designing photos, give Canva a try. You have proofread your post, enhanced it with images and are now ready to share it with the world. Start by sharing your post on social media, as it allows you free distribution and the ability to test different messaging or titles. A tool like eClincher will allow you to schedule your blog post to be published on all of your social networks multiple times. Chances are you already promote your blog posts on social media, so you are probably wondering how your traffic is going to increase. Luckily we have one more step to go. This final step will increase your blog traffic, guaranteed. Once your blog post is live and you have begun promoting it, you will want to follow-up with the influencers that participated. Use your Excel spreadsheet to find their email addresses and send them another short email. You do not have to ask for them to share it, as most will anyways. 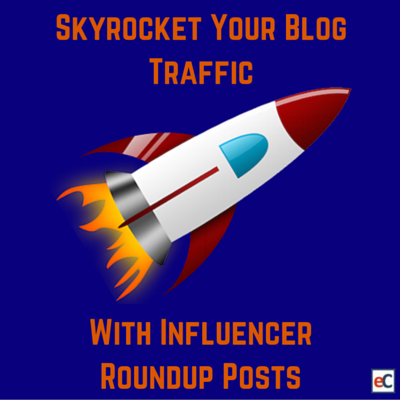 In the coming days, weeks and even months your influencer roundup post will drive traffic directly to your website. The best part? You have now formed relationships with many influential people within your industry. This alone is worth the effort and time you put into creating and promoting the post. Make sure you continue to nurture these relationships and consider them for future influencer roundup posts as well. Blogging is hard and attracting quality traffic is even harder. Smart marketers know how to leverage outside help to improve their results. Whether it is tools that make them more productive or collaborating with influencers to increase readership, working smart is the name of the game. Influencer roundup posts are one of the smartest things you could invest your time into as a marketer or blogger. We highly recommend that you try creating one and let us know how it goes! If you want more content like this delivered directly to your inbox, subscribe to our blog below. Thanks so much for the kind words! Feel free to subscribe to our blog and we will email the posts directly to you.